The new Apple TV is here and it promises to be the best version yet. The latest iteration of the Apple TV includes its own app store, a new controller with a glass touchpad that can be used for games as well as regular channel surfing, Siri and voice control, and a even a brand new interface. The new Apple TV comes with two storage options: 32GB and 64GB. The 32GB version sells for $149 and the 64GB option sells for $199. An HDMI to HDMI cable is sold separately for $19. Apple TV is finally a citizen in Apple’s huge app ecosystem. It now runs a version of iOS, called tvOS, and has its own app store. At launch, Apple claims it will have hundreds of apps, ranging from standard video streaming services like Netflix and Hulu, to games, to TV adaptations of popular iPhone and iPad apps like Gilt, Zillow, and Airbnb. Down the road, it’s easy to imagine Apple TV leveraging iOS to offer far more choices than the current content leader, Roku, which boasts over 2,500 channels. In effect, Apple TV has become a sort of iPhone or iPad for the TV, a platform for apps usable across a room. By making the box another vessel for its giant assortment of third-party apps and home-grown services, Apple is putting itself in a position to host programming the networks and studios are increasingly streaming, as well as new kinds of TV content. 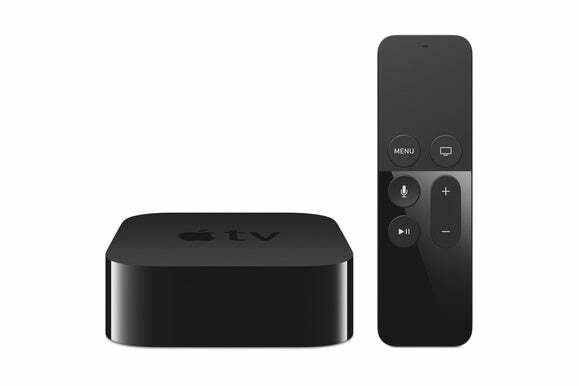 ...the company is moving Apple TV into a future that’s much broader and bigger than Roku’s or Amazon’s. And that makes the case. In effect, while it may not have reinvented all of TV, Apple has reinvented the streaming set-top box. Apple boasts the prettiest on-screen interface among the streaming devices that I’ve seen. It starts with stunning photographic screen-savers of major cities around the world and continues as you come across handsome movie and TV posters. Following a very short learning curve I found the new touch remote to be intuitive and a delight. You can move your thumb along the touch surface on the upper face of the remote to navigate what’s on the screen, or click the touch area to select an action. Dedicated buttons on the remote let you control play/pause, home, volume and other functions. ...Siri can be very helpful. During a movie or TV show, you can ask Siri to skip ahead or rewind by a specific time interval, watching video window previews along the way. In iTunes (and eventually other services), you can also ask Siri “what did he/she say” while watching a movie or TV show and Siri will rewind the movie for 15 seconds and show closed captioning for that long so you can hear or read unheard dialogue. Love that feature. After more than three years, the arrival of an improved Apple TV is something Apple fans will surely cheer. But if you're looking for something less expensive or have or will soon get a 4K TV, you're best turning to one of Apple's streaming rivals. iOS apps on Apple TV is a game changer. Serious game console players might dismiss it but Apple TV brings games people play every day to a bigger screen. You can switch between open apps on Apple TV in a similar way that you do on your iOS device. Double click the home button then swipe across to an app. Unlike with a mobile device, there’s no need to close apps to save battery so you’ll probably want to leave them open. This is a hybrid device that sits in-between other devices. You can’t record shows to it like a DVR but you can do a lot more than stream video content. For people who love their console games, this is an unlikely alternative. But for people who have discovered the fun of gaming through their mobile device, this is an entry-point to a new type of games console. This is the beginning. Apple has built the framework. What happens next is up to the app developers in maximising the potential in something new. Think of Apple’s fourth-generation box as a way to turn your TV into a giant iPhone. Ultimately, the Apple TV’s advantage is that it isn’t tied to the idea of channels, live TV or even streaming. It’s the place where developers are able to do the most cool interactive stuff for the widest audience. There’s already a workout show on the Apple TV that’s smart enough to know if you’re really working out. The TV of the future needs to be as powerful and easy to use as an iPhone, and this Apple TV is the first box—and the first Apple TV—to achieve that. The new Apple TV comes with a touchpad remote that lets you swipe to navigate the device's interface, and it lets you interact with Siri. If the new Siri Remote isn’t everything Apple claims it is, it’s close. Certainly, it’s a dramatic improvement over its predecessor in function and usability (it’s worth noting that Apple charges $79 for a spare, which is more than half the cost of the base model Apple TV). Siri is a TV remote that actually makes sense. It does what you want it to do with a minimum of fuss and clutter. There’s a touchpad on one side of the remote, and you can use it to navigate in all sorts of ways. Swiping across a film’s timeline to pinpoint a particular moment, for example, is surprisingly accurate and easy. Universal search — which not only enables searches across multiple streaming video services, but prioritizes the results based on the services you subscribe to — is fantastic. After using it for a few hours, I found myself resenting Apple for not enabling it sooner and leaving longtime Apple TV users like me to suffer with the lousy search function that preceded it. Perhaps the most considered new feature of the remote is an optional one: the wrist loop. Apple’s intent in offering it is clearly to save exuberant Apple TV gamers from accidentally flinging their remotes into TV screens during gameplay (Nintendo’s Wii bracelets did the same thing). I’m sure that’s helpful. But frankly, the loop is better used as a means of locating and rescuing the diminutive remote after it’s gone missing between couch cushions. I’ve used it for this purpose at least three times so far, and given the loop’s utility for this sort of thing, it’s puzzling that Apple doesn’t view it as a crucial part of the remote, instead selling it as a silly $13 accessory. ...there are some games, like SketchParty TV, that really sing on the Apple TV. SketchParty TV, which is like Pictionary on the TV — works incredibly well in this medium.